Many of us are searching for guidance and truth in our lives. Sometimes that reassurance can come from your Guardian Angel or a Friendly Spirit or Relative who has passed on – they just need a source through which they can reach you. <?xml:namespace prefix = v />Joann Seckus is a gifted psychic who has helped many clients make a spiritual connection. 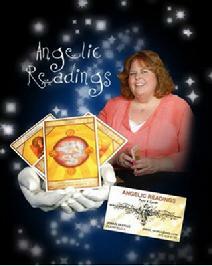 Using a deck of 36 Angel cards, she can tell you which Angels are working with you as you deal with the hopes and challenges of your life. Another of JoAnn's many spiritual gifts is her ability to read palms. She is also able to use Psychometry (the reading of energy from a personal object) to connect with an Angel, friend or family member who has passed over and has a message they want to convey. JoAnn is available for parties, events and private consultations in the Greater Chicagoland area.